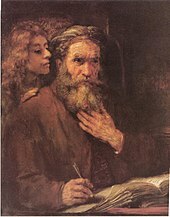 Rembrandt’s The Evangelist Matthew Inspired by an Angel. We can only rise above nature if somebody else carries the weight of the earth for us. What sort of philosophy would Plato have produced had he been his own house-slave? What would the Rabbi Jesus have taught if he had had to support a wife and children? if he had had to till the soil in which the bread he broke had grown, and weed the vineyard in which the wine he dispensed had ripened? The dark weight of the earth must enter into the picture of the whole. In “this world” there is no good without its bad, no day without its night, no summer without its winter. But civilized man can live without the winter, for he can protect himself against the cold; without dirt, for he can wash; without sin, for he can prudently cut himself off from his fellows and thereby avoid many an occasion for evil. He can deem himself good and pure, because hard necessity does not teach him anything better. The natural man, on the other hand, has a wholeness that astonishes one, though there is nothing particularly admirable about it. It is the same old unconsciousness, apathy, and filth. If, however, God is born as a man and wants to unite mankind in the fellowship of the Holy Ghost, he must suffer the terrible torture of having to endure the world in all its reality. This is the cross he has to bear, and he himself is a cross. The whole world is God’s suffering, and every individual man who wants to get anywhere near his own wholeness knows that this is the way of the cross.~Carl Jung, Psychology and Religion, Pages 178-179.